If you are like me then you may have passed Nong Khai several times while on a (visa) trip to Vientiane, Laos, but never bothered to actually spend a couple of nights in this town. Well, it’s quite tempting to choose Udon Thani 60km down south as a stopover instead that has arguably more nightlife and more girls. 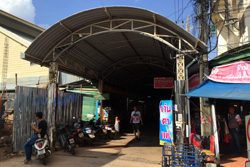 During my recent 2 week trip around Isaan where I completely updated my nightlife guides on Udon Thani, Khon Kaen and Korat (see the nightlife section in the top menu) I decided to spend some time in Nong Khai to check out the day- and nightlife. It only takes a couple of nights until you have a good overview of this small town on the border to Laos. There’s a relatively small expat scene that mainly frequents the two girly bar areas (see below) and the restaurants along the Mekong River Promenade. But it does take some more time to really explore everything this city has to offer after sunset including the surprisingly hip nightclubs, karaoke bars and happy ending massage salons. 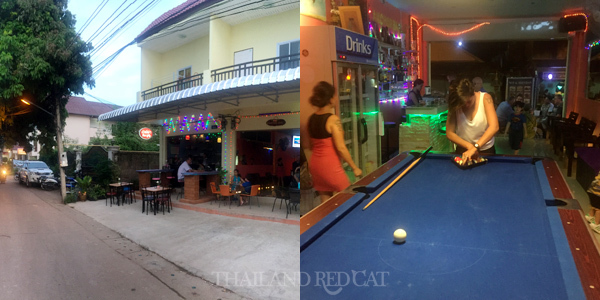 There are two girly bar areas in Nong Khai and they are located just a 5-10 minute walk (or 1 minute motorbike ride) from eachother. 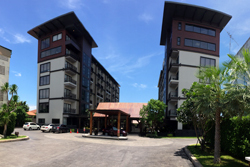 The first area is found on Rim Khong Alley just behind the Mekong River Promenade. There are four bars all in one place and another one just 50 meters down the alley. It’s the typical beer bars with local girls who are employed both as waitresses and “entertainers” for the mostly male clientele. You can even find some nice Lao girls in these bars. Anchor Bar is relatively small but very neat, well managed and with the nicest girls on the small strip in my opinion. They also got the best pool table and overall the most modern setup. Like you are welcome to choose the next song on YouTube (computer is connected to the TVs). Noi & Brendan’s Restaurant is just opposite of Anchor Bar, it’s much bigger, has a more relaxed atmosphere and excellent food (try the pork schnitzel with mashed potatoes). See below for information on the prices. The second and bigger area with well more than a dozen of different girly bars all along Soi Nitapat (see the map below). Unfortunately, quantity is not always quality and the girls in these bars aren’t nearly as attractive (on average) compared to what you may be used to from these kind of places. The British co-owned Candy Bar is among the better ones on this street with most girls under 30, which is surprisingly uncommon in this area. Seems like the more attractive ones prefer working down in Udon or if they are really diligent in Bangkok, Pattaya and Phuket. Most of the guys in those bars are retired and you only see a few travelers who really want to be entertained. Many of these bars are so sparsely visited that they already close at midnight and the ladies heading to the night clubs to really start partying – and maybe find some company for the night. Prices: Big bottles of beer for 80-100 Baht in all of the girly bars in Nong Khai. Almost identical prices for spirits (like I had a gin tonic at Anchor Bar which was just 90 Baht). That’s quite awesome but at the same time makes you wonder how the bar owners can make a living out of such prices and customer base. Lady drinks are also very reasonable at 120-130 Baht. If you would like to take a girl out of the bar before she finishes work that’s usually possible if you get on well enough and you bought her a couple of lady drinks. Then you’ll need to pay the barfine which is generally 300 Baht (sometimes even 200 Baht) plus however much she wants for the “romantic” time you spend together. 1,000 Baht for the whole night is probably the maximum you should pay. If you want to drink with the local Thai guys and girls in Nong Khai there is no shortage of places to go. The majority of bars are found along the Mekong River Promenade (eastern side, see map below). 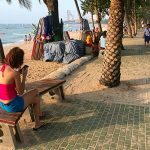 There’s not much of a point to mention any names here, not only are they mostly in Thai but also they are more or less all the same well visited and you can enjoy yourself in any of these bars – if you come with a friend or are not too shy to make the first step talking to the girls. Prachacheun deserves its own mention. It’s a beautiful and very cosy mix of bar and restaurant with live music and they also got plenty of very attractive hostesses (much more beautiful than in the Farang oriented girly bars). They can sit with you if you like and there’s no hourly charge like in the karaoke bars but you will need to buy them 5 fruit shots at 100 Baht each to get started. The Thai guys usually order a bottle of whiskey and some plates of Thai food to share with two or more girls. Prachacheun is owned by Country Club next door (see nightclub section below) and as soon as the bar closes at around midnight most of the hot chicks are hitting the club (unless their customers want to take them somewhere else). I couldn’t have made a better choice staying at the new Amanta Hotel. It’s right opposite of Prachacheun and Country Club, close to everything, great deal for 1,400 Baht a night for their fantastic rooms and if that wasn’t enough, they also got a Sky Bar on their roof. It’s called Sky Bear (because they themed it with lots of bears around) and has two, well actually three floors both with air-conditioned rooms (see picture) as well as a 360 degree all open air rooftop bar. When I think back about my trip to Nong Khai the first thing I remember is drinking a cool Beerlao Dark (90 Baht) at this bar while soaking up the views over Thailand, the Mekong River and Laos on the opposite river bank. I took a video on the rooftop that you can find at the end of the guide. The best and longest established night club in Nong Khai is The Riverside Country or most commonly referred to as just “Country”. It almost looks like a typical Tawan Daeng (the Isaan style bar and restaurant with Morlam Performances on stage), means lots of wooden tables around where people not just share bottles of whiskey but also have some food. There’s also a slightly elevated floor with good overviews of the whole club. 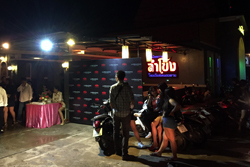 They have a live band playing on stage every night and this is also one of the best places to meet super attractive Nong Khai girls who are not out for money. After Country the second most popular club in town, Sam Ran is off the main road not too far from the girly bar area of Soi Nitapat. It tends to have the youngest crowd of all who are standing on the round tables with their groups, sipping on their whiskeys and dancing to the live music on stage. Just like all other clubs in town they have to close at 2am so you can try to hit on some nice local girls who always seem to outnumber the guys in this place. Only few foreigners know about this club, it’s mentioned nowhere and even I only learned about it while talking to one of the girls in Anchor Bar. I asked her if there’s another pub (that’s how the Thais refer to nightclubs) apart from Country and Sam Ran and she said yes: Lam Kong. I followed her instructions and looked for it on my bike, and after some time I found it in the eastern part of Nong Khai. It seems to be quite new and they also got some concerts there like when I visited the admission fee was 200 Baht. Another hip party place and there’s also a nice bar called Huai Kwang right next to the club. 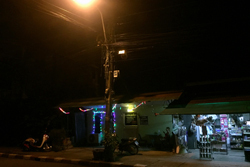 There are currently no soapy massage parlors in Nong Khai. I checked with several Tuk Tuk drivers and the closest one from here is Oscar’s Fishbowl in Udon Thani. 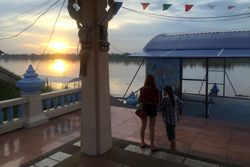 Nong Khai is pretty quiet during the day and once you have checked off all the things to see and do before sunset you might easily get bored before the bars open. One way to not only stay busy but to really enjoy yourself is visiting one of the non-so-traditional massage salons. There are quite a few of these places that offer happy endings in exchange for some tip and I have marked them all on the map below (see the best and most naughty ones like the one in the pic marked in pink). Standard prices are 300 Baht for a Thai Massage and 500 Baht for an oil massage for 2 hours. 1 hour is usually also available for a discount, just talk with them. 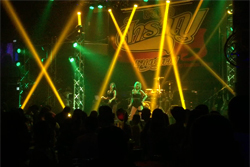 Partying at the karaoke bars in Nong Khai can be a lot of fun, but make sure to inquire the prices first in order to avoid bad surprises once the bill comes up. One place I went to charges 99 Baht for a big beer, 40 Baht per lady to sit with you and 100 Baht per 5 songs she sings with you. Most bars close at 1am and there is no option to take out the girls before that. The karaoke bars are also the few places you can meet some ladyboys, especially the bar on the main road has a bunch of quite attractive shemales working. The area where you would expect street prostitutes to wait for customers at night in Nong Khai is obviously the river promenade. However, I checked several times and couldn’t spot any – the one in the photo is just a normal hot girl taking pictures for her facebook. I even drove around town late at night to find something including the railway station – without discovering anything. Not a problem really since there is no shortage of options to get laid in this town. It’s almost a tradition to finish my nightlife guides with a short description of the night bazar. The one in Nong Khai is located on Rim Khong Alley. Coming from the Riverside Girly Bar area, just follow the street to the east and after just 100 meters you’ll find the night bazar that is covered by corrugated iron. Almost half of the shops are actually restaurants and the other half consists of mostly fashion and accessories shops and fewer tourist stuff than you might be used to from elsewhere.